Availability:: Please allow 2-5 days for assembly before shipping. Build your own custom Manzanita centerpieces, ready to use! Select your own branch/box color or finish, and we'll build them for you. Each branch wil already be fastened to the box- just add loose moss, glass gem marbles, or river stones and decorate the branches. Each centerpiece is approximately 24 inches tall. The box is made of wood, and in the finish you select. Each box is 6" wide (outside dimensions). 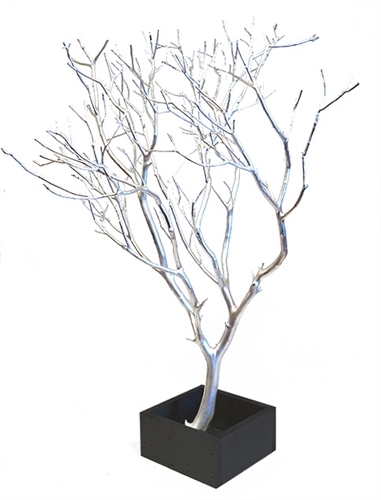 Includes a high quality Manzanita branch, mounted in it's own base. Each centerpiece is built to order. Please allow a couple of days for assembly by our staff. The bases are 6" wide, approximately. Please allow 2-5 days for us to assemble your custom centerpieces before they are shipped. No two branches are ever the same shape. We strongly urge purchasers to read the Manzanita Buyer's Guide before purchasing manzanita branches. Bark: color and condition of the bark will vary with each season, harvest area and time of year. 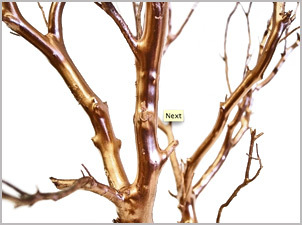 Spring through Summer (six month period), Manzanita bark will regenerate and peeling will take place. To remove loose or peeling bark, use a soft brush. For stubborn areas, use a light wire brush. Some branches may turn a gray color, which is normal. If the entire piece turns gray, please send us photos so that we can assist you with this. For peeling and gray areas, the best solution is to touch up with floral paint, such as Design Master's "October Brown" floral paint available at Michael's Crafts. We received our order of Manzanita branches. We could not be happier with the product. We will definitley order from Blooms & Branches again. Very â€œBeautifulâ€ Manzanita Branches! Packed very nicely and arrived on time. When I unpacked them they were more beautiful than I could have imagined. Great product. Arrived on time and was better than expected. It was packages so well as to have minimum damage. Excellent price as well. I will be shopping there again. These are gorgeous and exactly what we wanted for the Halloween themed wedding! We requested natural branches painted black and ordered the bases as well. They are perfect! We are going to put burlap in the boxes and little purple lights shining up into the branches. They look just like eerie dead trees, which was what we were going for. We can't wait to put them on the tables for the centerpieces at the end of the month. We would TOTALLY recommend Blooms & Branches. Great price, delivery, customer service and product!